Example 1: In a flat-Earth, the area of the Earth that is in the daytime and those at night are not split evenly. Solution: they created a flat-Earth model with a glass dome on top and used a flashlight as the Sun. Example 2: In “shadow of a stick” experiments done in multiple locations, sun rays do not converge to a single point of the Sun. Solution: they created a model where they used a concave lens between the Sun and the surface. Example 3: A sunset can never happen on a flat Earth. Solution: they created a model where they used a Fresnel lens between the Sun and the observer. All of these ‘solutions’ can only ‘explain’ a particular phenomenon but conflict with each other. These ‘solutions’ cannot possibly coexist. These ‘experimental models’ can only be regarded as far as hypotheses. They still need to prove if the models represent reality. But they jumped to conclusions, and take the models as ‘evidence’ of a flat Earth. Even taking those as hypotheses are too far. Any hypothesis needs to be consistent with every related observation, or at least not in conflict. 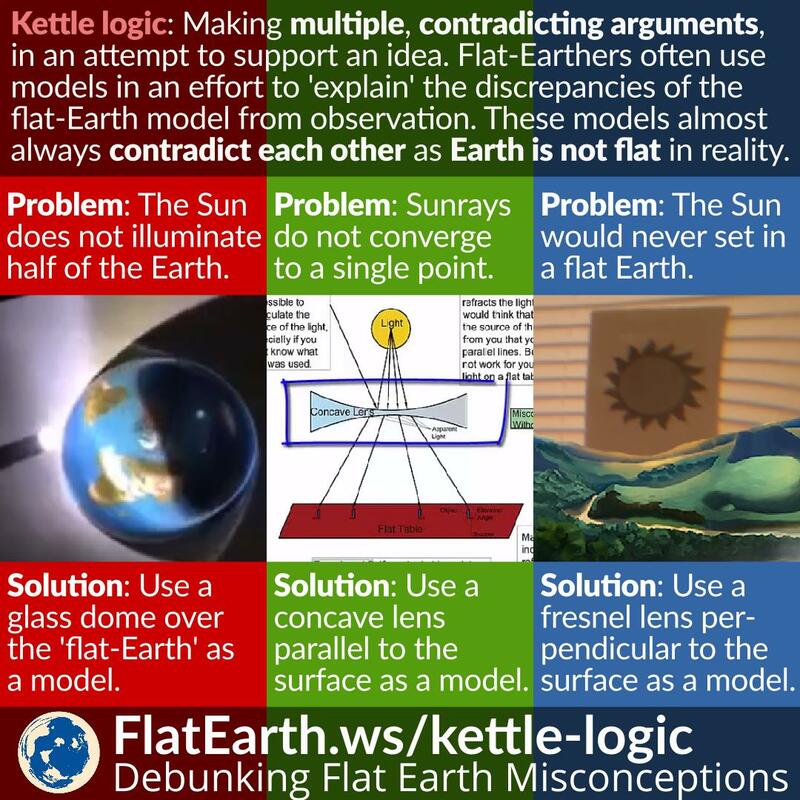 Flat-Earthers are happy to invent a specific ‘explanation’ for every single specific phenomenon, and if another problem arises, they would plug that up with another ‘explanation’, and so on. Meanwhile, most of these ‘explanations’ are actually in conflict, and cannot possibly coexist with each other. In other words, they resort to kettle logic to present their arguments, and thus, the explanations are invalid.